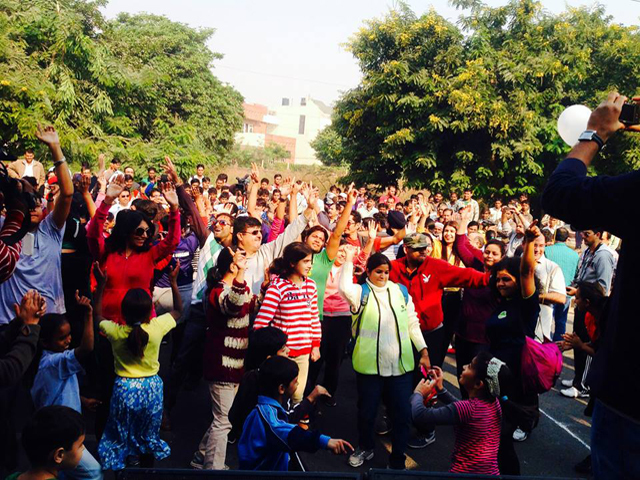 The first ever Raahgiri Day took place in Gurgaon, India on November 17, 2013. Photo courtesy of Raahgiri Day organizers. This post follows up on TheCityFix’s article that announced the launch of Raahgiri Day last month. On a cold winter morning on November 17, 2013, over 10,000 residents of Gurgaon, India, poured onto the streets to celebrate their city. Raahgiri Day had arrived. From 7:00 am to noon, 4.5 kilometers (2.8 miles) of major city streets were closed to vehicles to allow thousands of people to enjoy them as open, public spaces. Without vehicles dominating the streetscape, pedestrians, cyclists, and runners all converged on the streets. In a breakthrough moment for urban India, the roads were car-free and people-friendly. During the first Raahgiri Day, children took the opportunity to play soccer, cricket, and badminton, skating enthusiasts honed their skills, and there were street zumba classes for fitness enthusiasts. At the end of the day, citizens reported feeling empowered about the change they could bring to their lives, and more enthusiastic about their city. With 31% of India’s massive population currently living in cities, issues of access and equity are quickly becoming priorities in urban planning strategies and practices. By raising awareness about the benefits of non-motorized modes of transport and providing an opportunity for Gurgaon’s residents to experience them first-hand, Raahgiri Day marks an important step towards building momentum for more equitable urban spaces in India. In 2006, the Indian Government introduced the National Urban Transport Policy (NUTP) in an effort to promote people-centric transport solutions, and increase the usage of non-motorized transport in cities – especially bike-sharing programs. Based on that model, Haryana’s state government developed an integrated mobility plan for the Gurgaon-Manesar Urban Complex in 2010. The plan proposed the creation of 500 kilometers (310.7 miles) of footpaths and 210 kilometers (130.5 miles) of bicycle lanes – appropriate measures for Gurgaon, where non-motorized trips, including those made by walking, constitute about 30% of total traffic. Unfortunately, the plan has served as little more than a policy document rather than a catalyst for action. Infrastructure for non-motorized transport remains inadequate on the ground, and none of the proposed bicycle lanes have been built. It is hoped that Raahgiri Day will serve to generate increased public demand for action by the state to implement the proposals of the 2010 plan. The huge turnout at the first Raahgiri Day suggests that many Gurgaon residents no longer want to rely on cars alone for their travel. Instead, they just want to enjoy their city’s simplest daily pleasures: walking and cycling on accessible, pleasant, and safe streets. And since people from all walks of life joined in the fun at Raahgiri Day, the event also underscored the reality that when given access, individuals from a wide range of social groups will take advantage of welcoming public spaces. More importantly, Raahgiri Day is helping to change conceptions of the bicycle as the “poor man’s vehicle,” a belief that often intensifies social inequities and drives the purchase of private vehicles in India and other developing countries. As evidenced by extensive media coverage, Raahgiri Day has become a landmark event that’s succeeded in setting a social precedent not just for Gurgaon, but for India as a whole. With citizens expressing demands that Raahgiri Day become a permanent event in Gurgaon, and that it should be expanded to other cities, Raahgiri Day is building a powerful movement behind transport and urban planning focused on people.